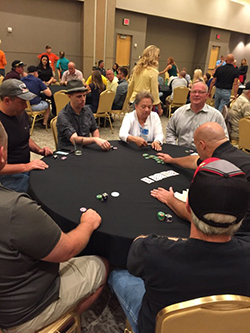 Join us for the Spirit of Courage Poker Tournament to raise funds for patients needing financial assistance and as we celebrate and honor four amazing individuals: Deb Bladt, Darcey Butts, Bobbi Calderon, and Bob Steele. A No Limits Texas Hold 'Em Poker Tournament! Registration begins at 12 p.m. and the tournament begins at 1 p.m. Plays have a chance to win wonderful prizes including a prize for knocking out the Celebrity Bounty at your table! To download a registration form, click here.